Garage coaches are a perfect way to take your favorite items along, without towing a trailer! 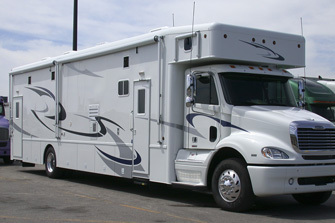 Every coach is custom designed to suit your needs, so whether you are hauling a car, motorcycles, sand rails, or a number of dogs to a dog show, we can help turn your coach into the perfect hauler. Options such as lifts, tool boxes, bathing stations or simply extra beds for the grand kids, nothing is too crazy for us to work with. Hot air balloon baskets, kayak storage, business supplies...the list can go on and on. Equipped with a heavy duty lift gate as a standard feature, the garage can be sized to fit your needs. The living quarters are just as luxurious as the full motorhomes, only slightly smaller. Love to tailgate? Here is the ultimate rig designed just for that. Set up the living area to haul all of your buddies to the event, while the garage is home to your supplies needed for the perfect bar-b-que set up at the game! Don't forget the big screen TV mounted on the outside of your coach so you can watch the game and enjoy the beautiful weather under your awning!